With a responsive layout the website can be seen on all sizes of screens. 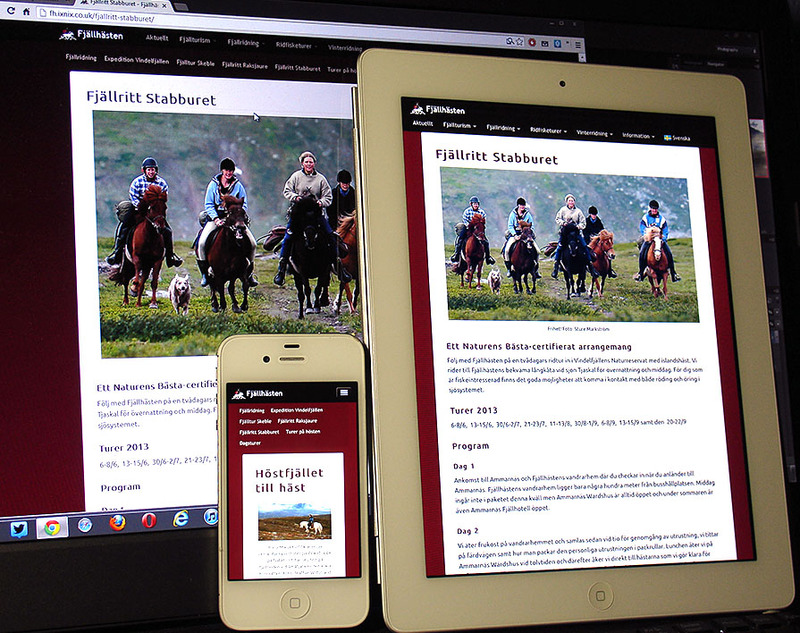 Our website acknowledges which size of screen you use and adapts the layout automatically. In practice this means that you have access to all the information on our site whether you sit by your computer, use your tablet computer or if you are in town with your mobile phone. On most sides there is a row at the bottom where you easily can print or share it with your friends on social media. You can also send an e-mail message to a particular receiver if you prefer that. All material on this server is protected by copyright by Fjällhästen Ltd. and/or their cooperation partners. The material may not be reproduced other than for strictly private purpose, for private use. Most photos on the website are taken by professional photographers and we ask of you to respect their work by not copying pictures to other forums. The texts on the website belong to Fjällhästen AB (Ltd.). Photographers in alphabetical order: Calle Bredber, Mikael Båth, Marcus Dezayo Hallquist, Sture Markström, Ulf Johansson, Kalle Jonasson Collberg, Peter Schmitt and Staffan Widstrand. There also occurs some pictures on the webiste that Fjällhästen’s guests have taken and these are published with their consent. It’s Mikael Båth at Ixnix Group Ltd. who is responsible for design, copywriting and development of our website.